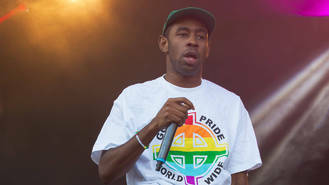 Rapper Tyler, the Creator has confirmed speculation he is attracted to men by revealing he had a boyfriend in his teens. Fans began assuming the hip-hop star was bisexual after the release of his new album Flower Boy last month (Jul17) - the project featured songs alluding to his attraction to men. Lyrics on his new track I Ain't Got Time, like, "Next line will have 'em like 'Whoa'/ I've been kissing white boys since 2004", suggested he is gay and on Tuesday (15Aug17) Tyler confirmed fans' suspicions on the Koopz Tunes radio show. "I had a boyfriend when I was 15 in f**king Hawthorne (California)," the 26-year-old revealed. "If that's not open minded, I don't know what is." Tyler did not elaborate on his romantic affair and instead moved on to topics surrounding his career. The hitmaker revealed he's not sure if he will tour on the back of Flower Boy, noting his upcoming show at his own Flog Gnaw Carnival in Los Angeles in October (17) has a "75 per cent chance" of becoming his final performance of the year (17). "I don't f**king know," he reflected before declaring, "I'm not going on tour this year. I might do, like, a week and a half of random cities, but I'm actually not going to go on tour this year." Flower Boy is Odd Future star Tyler's fourth record and his first release as a Columbia Records artist. He's not the first Odd Future collective star to 'come out' - former group mate Frank Ocean published an open letter on his Tumblr blog in 2012, recalling his feelings for another man when he was 19. Singer Robin Thicke is set to become a father again - and the baby is due on his late dad Alan's birthday. The Lady Antebellum family is about to swell by two - Hillary Scott and bandmate Dave Haywood's wife are pregnant. Katy Perry has been forced to postpone her Witness: The Tour due to "unavoidable" production delays. Ariana Grande wowed fans in Japan during her Dangerous Woman Tour when she spoke to them in their native tongue. Country star Tanya Tucker has written an emotional tribute to her late ex, Glen Campbell, a week after his death. Pink has "made amends" with Christina Aguilera after over 15 years of feuding. The melody of summer smash Despacito came to singer Luis Fonsi in a dream. Britney Spears' conservators have reportedly filed legal documents requesting changes to the singer's will. Chris Brown and Rihanna's fairytale romance fell apart after he lied to her about a former flame.